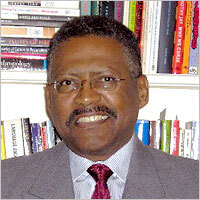 ARTHUR K. SPEARS is Presidential Professor at The City University of New York (CUNY). He is affiliated with two units of CUNY: The City College, Anthropology Department, and The Graduate Center, where he is a doctoral faculty member of both the Linguistics and the Anthropology Programs. He served as chair of the Anthropology Department for many years and also as Director of the Black Studies Program (The City College). His Ph.D. in Linguistics was earned at the University of California, San Diego. From Northwestern University, he received an M.A. in Linguistics; and, from The Johns Hopkins University School of Advanced International Studies, he received an M.A. with Distinction in International Relations. He earned a B.A. with a triple major in French (Honors), Spanish, and Political Science from the University of Kansas. Dr. Spears’ research spans linguistic anthropology, sociolinguistics, pidgins/creoles and language contact, grammatical analysis, race and ethnicity, education, and ideology. The languages he specializes in are African American English and Haitian Creole, along with other French-related creole languages. He works in four languages (English, French, Spanish, and Portuguese) and is one of the few individuals ever to have passed the U.S. State Department’s contract interpreter examination in four languages. Prof. Spears is the founder and first editor of Transforming Anthropology, the journal of the Association of Black Anthropologists, a unit of the American Anthropological Association. He was the President (2007-2009) of the Society for Pidgin and Creole Linguistics, the largest international body devoted to promoting the study of contact languages and their speakers. Among Prof. Spears’s recent books and journal special issues are The Haitian Creole Language: History, Structure, Use, and Education (co-editor, 2010); Language, Inequality, and Endangerment: African Americans and Native Americans (editor, special issue of Transforming Anthropology, 2010); The Structure and Status of Pidgins and Creoles (co-editor, 1997); Race and Ideology: Language, Symbolism, and Popular Culture (editor, 1999); Black Linguistics: Language, Society, and Politics in Africa and the Americas (co-editor, 2003); and Languages and Dialects in the U.S.: Focus on Diversity (co-editor, 2014). Among the journals in which his publications have appeared are Language, Language in Society, Journal of Pidgin and Creole Linguistics,Transforming Anthropology, American Speech, Études Créoles, Journal of Linguistic Anthropology, and the Anthropology and Education Quarterly. Dr. Spears serves on the editorial panels of leading journals and the Creole Language Library of John Benjamins Publishing Co. He has served also as legal expert in court cases involving race, speech analysis, and the use of controversial words and symbolism. Believing in the importance of disseminating scholarship, he has presented information connected with his areas of specialization through media appearances on the British Broadcasting Corporation (“The Story of English”), Réseau France Outre-Mer (Groupe France Télévisions), Black Entertainment Television, Gil Noble’s current events talk show on ABC, National Public Radio, WBAI, and Inner City Broadcasting’s WLIB, among other media organizations. His biography appears in The African American National Biography (edited by Henry Louis Gates, Jr., and Evelyn Brooks Higginbotham, Oxford University Press). © 2010–2016 Arthur K. Spears. All rights reserved.